"the fuel for music is songs." It all begins with the song. The song makes the singer, and the singers have given Nashville the nickname and reputation of Music City USA. Sporting four record pressing plants, ten talent agencies, ten recording studios, five major trade papers, twenty-six recording companies, and three performing rights organizations, Nashville enjoys a one-hundred-million-dollar a year business. It's no coincidence that one out of every two records now sold in the United States comes from a Nashville studio. Without the writers of songs, however, there would be no sound. And since Nashville's the "goingest" and most unique corner in the world of music, Nashville's songwriters are also of particular interest. Inside Music City USA recognizes the songwriter's importance and explores the role of several key contributors to the "Nashville Sound." Songwriting greats such as Boudleaux Bryant, Jack Clement, Harlan Howard, Billy Edd Wheeler, Hank Cochran, John D. Loudermilk, Willie Nelson, Bobby Russell, and Marijohn Wilkins are highlighted in the book. These living legends of the music world reveal their personal secrets to success, as well as the mistakes that a prospective songwriter can avoid. 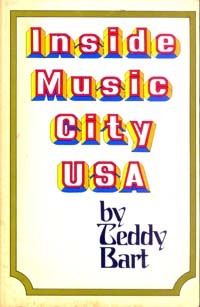 In this portrayal of the Nashville music scene, Teddy Bart devotes part of his book to the role of the music publisher and the functions of the performing rights societies, information which is invaluable for those wanting to break through and succeed "Inside Music City." The familiar voice and face heard and seen on WSM-TV's "Noon Show" and WSM radio's "Waking Crew" in Nashville belong to a talented young musician-songwriter, Teddy Bart. Mr. Bart came to Nashville in 1959 and has collaborated successfully with Beasley Smith on six songs which were recorded by Al Hirt in his "Honey in the Horn" album. Other songs he has written have been recorded by Vic Damone, Brenda Lee, Johnny Mathis, Archie Campbell, and Jeannie C. Riley. Currently, Mr. Bart hosts his own talk-music show on the radio. Mr. Bart is married to the former Jana Ewing, whom he met while stationed at Fort Jackson, South Carolina. They have two children, Jody Lynn and Kevin. In 1966, he was listed by the Jaycees as one of the Outstanding Young Men of America and was named Honorary Chairman of the Davidson County Association for Retarded Children in 1969.